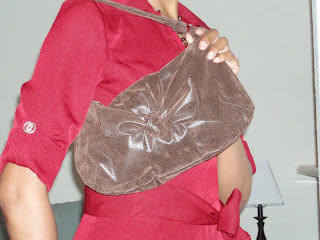 Yes, homemade purses can be very fashionable and cute. It was extremely easy to construct; it took about two hours to sew. I don’t have any pics of the construction process, but the instructions were very easy to follow. The instructions call for interfacing, but I opted out of it since the leather already had a synthetic backing on it. The most challenging part of the purse was putting the bow together. I couldn’t gather the leather, so I fan-folded it and hand sewed it. 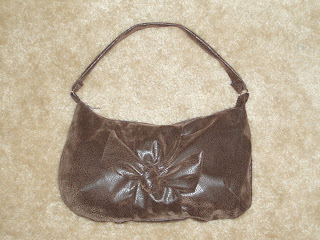 Then I had to hand sew the bow to the front of the purse. It really wasn’t too bad though. Even the zipper went in like a snap. Good job.Looks like you bought it right out of the store.